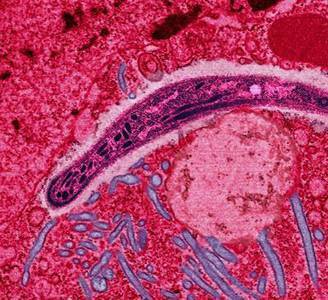 Plasmodium Falciparum does not specifically select its host; it invades any red blood cell at any stage of existance. Multiple sporozoites can infect a single erythrocyte, this leads to three or even four small rings to appear as an infected cell. Plasmodium Falciparum is similiar to Plasmodium malariae as it does not produce hypnozoites in the liver and often relapses from the liver are not known to occur. The incubation period of Plasmodium Falciparum is the shorest of all plasmodia as it ranges from 7-10 days and does not prolong to months or years. The early influenza-like symptoms are chills, fever, servere nausea, vomitting and diarrhea. Malignant tertian malaria is appropriate for this infection because the symptoms of such malaria are similar to those intestinal infections such as nausea, vomitting and diarrhea, therefore, it carries the name "the malignant mimic". Death usually happens when it is not treated. Drug resistant strains such as phenanthrene methanols, halofantrine, lumafantrine, artemesinins, artemether and artsunate.